Happy first Monday of July! And boy is it a hot one. It is the release day for the first book in the Psalm series by three different authors. 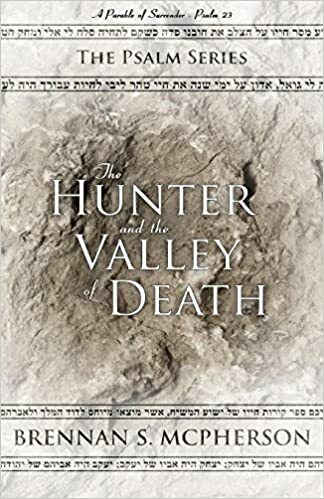 The first book is…”The Hunter and the Valley of Death” by Brennan McPherson. And I had to absolute pleasure of being able to read and review it. So I would very much like to share about the book today, as well as my review. A man wakes up in the Valley of Death and realizes he’s given up everything to attempt to kill Death so that he can bring his Love back to life–but when he fails, who will be there to rescue him? This was an extremely profound story. I wasn’t sure what to expect going into it, but it really did astound me. It felt very much like Pilgrim’s Progress or “Till We Have Faces” by C.S. Lewis. A fantasy parable/allegory. And it was beautiful and powerful. The way it was written – so unique, and it just flowed excellently. It captivates the reader and fully draws you into its world. The symbolism of Psalm 23 was lovely, and how it was all portrayed through the story – brilliant. I found numerous truths in “The Hunter and the Valley of Death”. And oh, the beauty of that truth, specifically regarding suffering. That couldn’t be more apt for me to read right now. I feel like I can’t even give this book justice in a review for the beauty of it, and the deep meaning. The only thing is I would have liked just a tiny bit bigger emphasis made of the repentance stage, as that is very important. And personally, my favourite version of Psalm 23 is the KJV or NKJV – I feel it holds the most reverence. So I would’ve preferred to see that in this, but as I’ve stated in past reviews, I know that everyone has different opinions on Bible versions. Otherwise, I really did love this book, and the notes at the end. It was a short novella, but full of meaning. I am looking forward to rereading it, just to digest more of it. Excellent! *I didn’t make the graphics; they were provided by the authors of the Psalm series.